Presents for Patients® will kick-off the 29th season on Thursday, Nov. 29 from 5 to 7 p.m. at St. Barnabas’ Gibsonia Campus, 5827 Meridian Road. The free Christmas celebration is open to the community, inviting families and neighbors for a night under the stars as St. Barnabas lights the 90-foot Christmas tree. Activities include Zambelli fireworks display, musical entertainment, hot chocolate by a toasty bonfire and sing along to Christmas carols. Refreshments will be served. Kevin Benson from WPXI-TV will be holding live coverage interviews with Presents For Patients® spokesperson Valerie Wilden. As the night comes to an end, guests can pose with Santa Claus for keepsakes! PRESENTS FOR PATIENTS® was founded in 1984 by St. Barnabas president William V. Day. The program has granted gifts and holiday visits for more than 431,113 patients in facilities in Pennsylvania, Ohio, New York, Tennessee, West Virginia and South Carolina. PRESENTS FOR PATIENTS® mission is to see that every patient in a long-term care facility receives a holiday visit or a gift. The goal of PRESENTS FOR PATIENTS® has always been to touch the lives of nursing home patients through kindness and generosity of spirit. 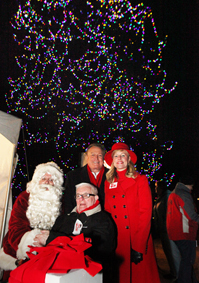 The Tree-Mendous Light Up and PRESENTS FOR PATIENTS® celebration is open to the public. RSVP by calling 724-443-0700, ext. 5310 or e-mail ltassos@stbarnabashealthsystem.com. Alzheimer’s and Dementia Support Group meets at 7 p.m., the 2nd Wednesday of every month, at Orion, 4361 William Flynn Hwy. Sponsored by Orion Personal Care Residence. Call (412) 337-6731. Alzheimer’s Support Group, meets 10-11:30 a.m., the 2nd Saturday of the month, Christ Church, North Hills, 5910 Babcock Blvd. For info, call Karen (724) 934-0048. Arden Courts, 1125 Perry Highway, offers a support group for families dealing with dementia. Meets every 3rd Weds. of the month. Call (412) 369-7887. Celebrating Senior Champions Dinner & Auction, Oct. 11, at the Omni William Penn Hotel. For details on sponsorships and tickets, call (412) 622-9239 or vanhornpa@upmc.edu.